KANSAS CITY, Mo. — For now, the Park Hill Trojans are still chasing Liberty in the standings. The Blue Jays won the Class 4 District 4 tournament on Saturday, Feb. 9 with 244 points, while the Trojans finished second with 224 at Oak Park High School. Park Hill nudged Staley by a point for the final plaque awarded by MSHSAA after the two teams were tied at 196 going into the first- and third-place matches. Park Hill’s Trey Crawford gets a near fall against Liberty’s Austin Kolvek during the Class 4 District 4 meet on Saturday, Feb. 9 in Kansas City. Liberty had beaten the Trojans in a dual and head-to-head in many tournaments and are ranked No. 13 in the country in the latest Intermat rankings. Park Hill is No. 15 and the team between the two is Broken Arrow, Okla., which lost to the Trojans in a dual to open the season. Now, the stakes are the highest as both teams head to Columbia with 11 state qualifiers and have to mix in state powers from St. Louis, like defending state champion Christian Brothers College. Park Hill finished with four district champions: Ethen Miller, Trey Crawford, Devin Winston and Ashton Sharp. Crawford secured his first district title with a win over former teammate Austin Kolvek, now he’s at Liberty in the 132-pound class. Crawford posted a 6-2 decision in the fourth matchup this season against Kolvek, prevailing in each of them. Crawford is ranked No. 2 in the MissouriWrestling.com rankings, one spot ahead of Kolvek. The victory was a relief for Crawford after missing last year’s district due to a concussion and then taking second at districts as a freshman. Now he headed back to the MSHSAA State Wrestling Championships, which starts on Thursday, Feb. 14 at Mizzou Arena. Crawford was fifth at state as a freshman and last year could only watch as his team lost a chance to repeat as state champions by 13 ½ points. Ethen Miller (126) was the highest ranked Kansas City wrestlers in the class and took care of business with three wins. The No. 3-ranked Miller bested No. 4-ranked Kyle Dutton of Liberty by a 10-0 major decision in the finals. Top-ranked Winston improved to 37-1 on the season with a pin against North Kansas City’s Xavier Doolin in 1 minute, 3 seconds. The Minnesota commit went 4-0 and had pins in 1:06, 55 second and 1:00 to reach the 195 pound finals. Sharp, ranked No. 2 in the state, ended with a 7-4 win against Staley’s Jared Neel. Prior to that, Sharp (14-2) won 4-3 against Liberty’s Callum Trester in the semifinals. Cael Keck, Kal Miller, Blake Hopson and Simon Tesfamarian were runners-up for the Trojans, last year’s Class 4 state runners-up behind CBC. Keck lost a 9-1 major decision to Liberty’s Easton Hilton, ranked No. 1, but knocked off No. 3-ranked Cayden Dostson of Blue Springs, 2-1, in overtime in the semifinals. Kal Miller (120) lost 5-3 in overtime to Blue Springs’ Korbin Shepherd in the finals. The No. 5-ranked Shepherd, a state runner-up at 113 last year, beat No. 1-ranked Khyler Brewer of Staley in the semifinals, while Miller, a freshman, dispatched Ayden Dolt of Liberty, ranked No. 6. Later in the day, Dolt suffered a serious injury and was carted off by Kansas City Fire Department paramedics with a neck brace on. Hopson lost a showdown against state finalist last year when he dropped a 15-7 major decision to Liberty’s Greyden Penner, ranked No. 1 in the 170 pound weight class. That was the only non-pin victory for Penner, last year’s 160-pound runner-up. Hopson, ranked No. 3, took down No. 4-ranked Roman Tinoco of Fort Osage by a 16-0 technical fall in the semifinals. Tesfamarian (285) is ranked No. 3 but lost to unranked Preston Wiss of Staley by a pin with 2 seconds left in the finals. Prior to the fall, Tesfamarian had pulled within a point of tying Wiss. Park Hill’s Ryker Smith, Trey Safford, Grayston DiBlasi and Park Hill South’s Cameron Gillespie all took third to round out the area’s state qualifiers. Smith (113) nudged Staley’s Jackson Murray in the third-place match, 3-2. The two met in the quarterfinals and Murray won 2-1. Safford (138) was ranked fifth in the state and lost in the semifinals to Liberty’s Kage Lenger, ranked No. 6, by a 6-2 decision. Safford bounced back with a win against Park Hill South’s Gage Baska in the bubble round, 4-3, to earn a spot in a third-place match. There, the senior picked up an 8-2 win against Blue Spring’s DeAndre Thomas, ranked fourth. DiBlasi (145) lost in the semifinals to eventual district champion David Brooks of Staley, 5-4, but closed with two wins. The sophomore beat Lee’s Summit North’s Hunter Ross in the consolation semifinals and then won 3-1 against Fort Osage’s AJ Sanchez. Ending on a win and punching a ticket to state meant a lot for Gillespie, a junior and the Panthers only state qualifier. He lost a 3-2 heartbreaker in the semifinals to No. 4-ranked Jackson White of Liberty, but rebounded with a 16-0 tech fall against North Kansas City’s Seth Mattly in the consolation semis. In the third-place match, Gillespie pinned Lee’s Summit North’s Zane Ragland. 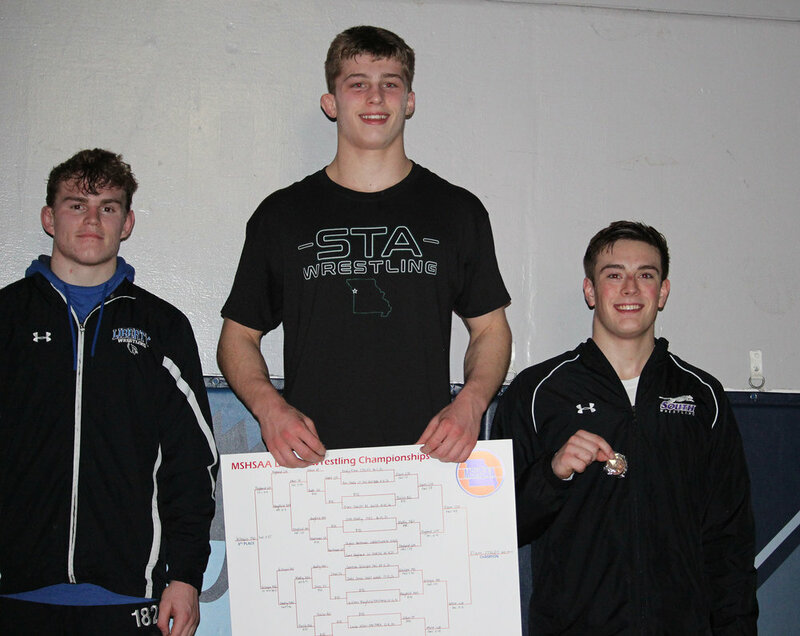 Park Hill South’s Cameron Gillespie, far right, took third place in the 182-pound weight class in the Class 4 District 4 tournament on Saturday, Feb. 9 to earn a return trip to the state championship. Gillespie, who has honorable mention status in the MissouriWrestling.com rankings, noted it was big to end at third place at districts as the draw matches up with a runner-up from another district. A loss would’ve had him facing a district champion from the other side of the state. Park Hill had close calls at 152 and 160, where Jack Vande Ven and Phoenix Thomas, respectively, lost in the bubble round that could’ve gotten them to the third-place match.